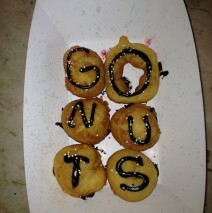 Home » Luscious Desserts » Mini Donuts! The automated donut machine where you can see little round wisps’ of dough floating peacefully on a river of hot oil flipping over mid stream and ending up in a donut mound. Cinnamon&Sugar – Powdered Sugar – Chocolate – Sprinkles – or just O’Natural. Nothing is more delicious as one of these hot sugared donuts!